← Minus One Buttress at Last! I was a little surprised when we met Malcolm Bass and Simon Yearsley in the North Face car park on Sunday night to see a couple of mountain bikes strapped to the back of Simon’s camper van. Clearly this prolific pair had a project lined up, and sure enough after sampling some excellent ice mid-height ice on the Ben, they set off up north to put to rest a long sought after objective. The route they had in mind was a line of icy grooves left of the crest of Flowerpot Buttress in the remote Luchd Coire on Seana Braigh. They first spotted the line in 1998 when making the first ascent of a Girl’s Best Friend on Diamond Buttress. They returned the following season, but the crucial central slabby section was insufficiently iced so they were not able to complete the line. 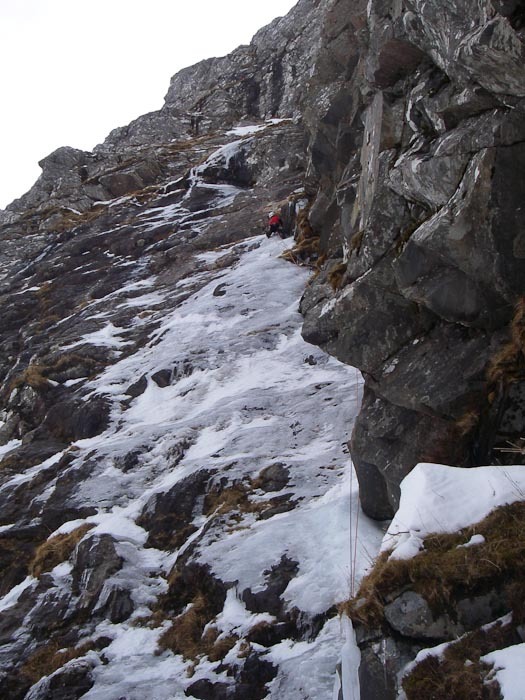 This time, the hunch paid off, and on March 10, they added The Road (VI,6) an excellent, varied mixed line. The route name was inspired by the modern classic The Road by Cormac McCarthy. The long approach up Corriemulzie driving up a drifted-in estate road and then cycling up the deserted Strath was not as grim as the novel, but arduous all the same. This entry was posted in New Routes and tagged Malcolm Bass, Seana Braigh, Simon Yearsley. Bookmark the permalink.